Thirty One was voted one of Wired.com reader's favorite apps of 2009! Available in HD on iPad! Thirty One is now available in an HD version designed for the iPad. Thirty One has recently got some great reviews, check out these sites to read the reviews and find other great apps! Voted number 1 card game by Toucharcade members! 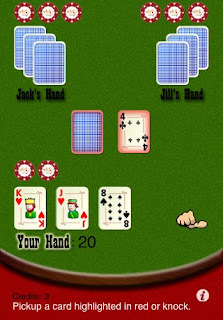 Thirty One has been voted the number 1 card game by members of Toucharcade, a community devoted to gaming on the iPhone and iPod Touch. Featured in Apple's "What we're playing" section! Thirty One has been featured in Apple's "What we're playing" area of the games section on the iTunes store. Just wanted to say thank you for the support that Thirty One has been getting from fans, we have over 100 fans on facebook! Thirty One is available on the App Store!